Do you have lists for things? Do they help? I wanted to look today at how lists are vital to keeping you on track and avoiding overwhelm in this busy world we all live in. Word of caution – however important lists are, they are only really useful when you actually use them, schedule in tasks from them, and stay on top of them. If not, then they are just as much use as random words on a piece of paper…… just saying….. I was at the gym the other week, as usual, and while I was putting everything into a locker, the last thing I always do is grab a routine list from my bag. I have several different routines that focus on different things, and I try and change them around frequently so I don’t get used to them and they make me work as hard as I can. However, on this particular day, I had forgotten to re-pack my lists after taking them out over the previous weekend to make changes etc…. I kind of knew what to do, for how long, how many reps etc… – but I wasn’t totally sure of myself – and it was this uncertainty that caused lack of focus and lack of motivation that day. I dithered for ages, procrastinating over what I should do, and ended up feeling that I had worked a lot less hard than usual. I didn’t feel that I had done a full workout, and instead of leaving the gym on a high, I actually felt quite low. All because of that small bit of paper……. If I have my list – I focus immediately – following the routine and not really having to think about it. Because I am sort of on autopilot, I can enjoy listening to music or an eBook at the same time, and I can get lost in my thoughts – which makes the time go quicker, and makes me feel like I’m getting more done with my time. It feels less like work. Why does not having a list hurt so much? Without a list, I had to put my brain to work much harder for me. I couldn’t zone out as much as I usually did, and I got overwhelmed at the choice of equipment that I had. With my list I simply walk to the right machine, do the exercises I have listed, and move on to the next one. Without my list, I felt like I had to visit more of the machines as they were all there waiting for me, looking at me!…..
Now, I know you may or may not go to the gym or workout – but this realisation helps with all kinds of lists – your TO DO list being a prime example. And, just as I was overwhelmed by the choice and variety of options that I had to decide on when I entered the gym without my list – that’s how you can get overwhelmed by all those tasks that are swimming around in your head constantly of stuff you need to get done. Without a list – without some sort of order – you end up either overwhelmed and doing nothing, or confused (not knowing what you need to do, and whether you have forgotten anything vital). You could walk around the house spotting things to do, but not know whether doing one thing would be better than doing another – and the procrastination sets in so you end up doing nothing apart from get frustrated. At least with a list you can scan the list to identify what’s important, what takes priority, and basically see the wood for the trees. It takes the guesswork out of things. As with my gym routine, my TO DO list works hard for me, and enables me to get the most out of my day. I can scan it each day and schedule in anything that can fit into my diary, and I am more likely to get through them, feel more motivated to get more done, and be as productive as I can be. TIP – Always schedule your TO DO’s – as they are much more likely to get done if you treat them like an appointment – this is the biggest tip I can give you for making your lists really work hard for you – otherwise they really will just get bigger and bigger and you will end up being as overwhelmed as you would feel without a list at all – it’s a cycle you don’t want to get in – so schedule, schedule, schedule! 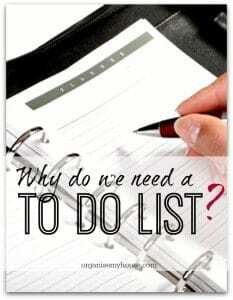 – Using your lists is vital! Do you use a TO DO list? Do you have lists for different things (just as I have a routine list for the gym)? One of the main reasons we all tend to have at least one list in our lives is to try and regain control over the never ending tasks we have to deal with. Without being able to clearly see what we have to do – then we are nowhere near as productive as we could be – which is such a waste. So – if you weren’t sure about the use of your TO DO list before reading this post – I hope this has helped clarify why they are so important. So, do you find that lists help you? Let me know below…..
Psst… – There’s a printable TO DO list available for free HERE – why not print it out and get started right now! Previous Post: « WHY WHITE BEDDING WORKS – EVERY TIME!